Continuous with the Supraspinous ligament. It forms a two-layered fibroelastic septum that separates the dorsal muscles of the neck and spans from the spine of the C7 to the occiput. Extends from the external occipital protuberance on the skull and median nuchal line, to the spinous process of C7. The deep fibers of the ligament attach to the external occipital crest, the posterior tubercle of the atlas, and to the medial surface of the bifid processes of the other cervical vertebrae. 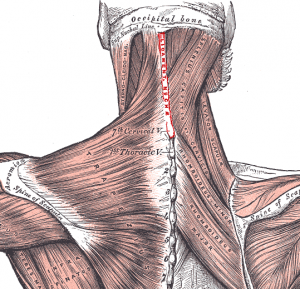 Provides an attachment for Trapezius and Splenius capitis. Letter to the Editor. Ligamentum nuchae as a graft material for duraplasty in patients with Chiari malformation type I. ↑ Takeshita K, Peterson ET, Bylski-Austrow D, Crawford AH, Nakamura K. The nuchal ligament restrains cervical spine flexion. Spine (Phila Pa 1976). 2004 Sep 15;29(18):E388-93.